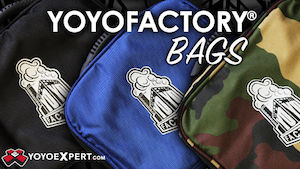 MagicYoYo has long been a standard for super affordable, entry-level yoyos but with recent projects like the Skyva and Metal Skyva with Jeffrey Pang they have begun moving into higher quality, specialty releases. The MagicYoYo REX is the culmination of this…a titanium/stainless steel bi-metal yoyo designed in collaboration with Yixing Tan. The result is absolutely stunning…the MagicYoYo REX plays with speed and power only available with this kind of extraordinary weight distribution. The body is machined out of titanium, a high strength/low weight ratio material that has become more popular among yoyo companies. According to MagicYoYo, processing each piece of titanium body takes more than 45 minutes, and when you include processing and assembling the stainless steel rim it takes approximately 1 hour to fabricate one half of a REX yoyo; that’s almost 15 times as long as making a normal aluminum yoyo half. The REX has a body thickness of only 0.5 to 0.7 mm…the same thickness as a few sheets of paper. The rims are made of high-density stainless steel. The edge of the outer rim is only 2.17mm, which makes the whole yoyo seem to possess a homogeneous thickness, like a single, smooth arc. This makes the REX feel very comfortable in the hand and very pleasing to the eye, but the real function is weight distribution. 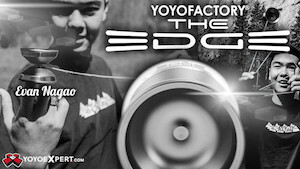 The rims account for over 55% of the total weight of the yoyo, making for absolutely incredible spin times. The MagicYoYo Rex is one of the absolute fastest and most stable competition yoyos on the market. There is always a lot of discussion about “speed combos” among competitive players, and this is the kind of yoyo that can help make you a speed player or accelerate your existing speed combos in a way that you have to try to believe. Some yoyos have a natural tendency towards faster or slower play, and while equipment is not a substitute for practice, having a yoyo that just naturally plays faster can definitely give you an edge. The MagicYoYo REX plays faster. From the gap to the materials to the weight distribution, everything about the REX is built for pure speed, and it definitely delivers. It’s very easy to buy into hype for a high-end release, but the MagicYoYo REX really does deliver a play experience on-par with the Luftverk Fulvia BTM or the Something Anglam TISS…extraordinary speed, stability, control, and quality at the highest-end of the production spectrum. The motivations behind the creation of the Bauhaus lay in the 19th century, in anxieties about the soullessness of manufacturing and its products, and in fears about art’s loss of purpose in society. Creativity and manufacturing were drifting apart, and the Bauhaus aimed to unite them once again, rejuvenating design for everyday life. With this aesthetic and philosophy in mind, the REX was created to be functional, simple, pleasing to the eye and hand, and reflect an ideal of creativity into an inanimate object. The result is incredibly appealing to the eye and to the hand. The MagicYoYo REX retails for $469 USD. This is a truly premium item, manufacturing to exacting tolerances out of the best materials available, and the price tag definitely reflects that. That said, it’s still $100-$400 less expensive than similar titanium/steel bi-metal yoyos from other manufacturers…so if you are looking to try out the ultra-high end of the market for titanium bi-metals, this is a perfect way to start with great quality and value. The MagicYoYo REX is available now at YoYoExpert.com. We’ve got a new video from the current Utah State YoYo Champion, Spencer Walker, and it’s good stuff. Dig in. Yoyos used are the Nomad and Rex by Square Wheels YoYo Company. The Square Wheels YoYo Company continues the festivities in promoting the release of the Rex with this video from Spencer Walker. Spencer makes yoyo-face, which is endearing, and has some really promising trick construction. Enjoy! The new Rex from Square Wheels YoYos is shipping out to retailers at the end of the week, and the Square Wheels team will be releasing videos with this new model to promote the drop. First up is Owen Ekblad, throwing down some great JonRob-inspired tech 5A play. Owen Ekblad drops some nice moves with a Square Wheels Rex and Rockefeller. But really, he had me at “Snape”.